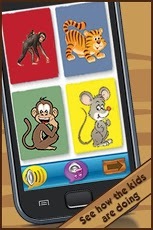 Animal Book is an app that helps your kid to recognize animals, know their names and the sounds they make. 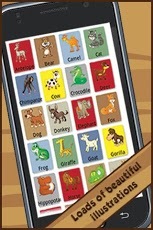 It has lots of beautiful animal illustrations, clear pronunciations and animals sounds. It is very easy and simple to use. It will provide hours of fun and learning for your kids. There is also a quiz section where the kid has to identify the animal based on animal name pronunciation and animal sound. 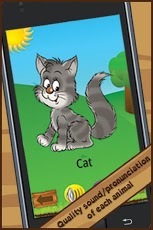 - 39 beautiful animal illustrations, animals sounds and animal name pronunciations. 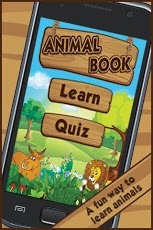 - Quiz to recognize the animals from their name and sounds. There are loads of different Android apps to help your kids learn their animals, but Animal Book, available for free, is one of the better ones available. 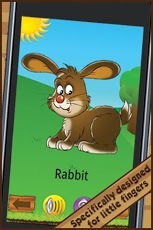 Don’t be fooled by its simplicity-it’s a stellar teaching app for children. Visually appealing and look like a great learning tool.